Whatever phase of life we’re in, whatever level of income, whatever job we work or goals we have, tracking our income and expenses with budgets can help us better manage the money we earn. Building a better budget will help you retain more of your hard-earned dough, and save it for accomplishing your goals more quickly. What is a budget? Well, from the 10,000 foot view a budget is simply a term for tracking money. How much do we have? How much do we spend? How do we plan to spend in the future? It’s all about knowledge and staying informed. Let’s talk about what budgets are NOT. The word “budget” is often associated with being miserly or penny-pinching, as if having proper priorities for our money is a selfish thing to do. In my experience that’s the opposite of how it really works. Having an accurate view of how your money is being spent (and how it should be spent) gives us greater flexibility and confidence in our spending decisions. It’s much easier to spend our money when we know that we’ve given ourselves permission to do so. And how do we give ourselves permission? We budget! Kind of like keeping a closet organized or a shed full of tools neat and tidy, we’re prepared to make instant decisions and be productive with our money if we know where everything is. I’ve written previously on the freedom that budgeting gives us. It’s actually a de-stresser, and not terribly difficult to get started with. Also, budgets are how we set expectations for ourselves before spending our money, so they help us stay accountable to our own financial goals. When you begin the budgeting process, you’ll probably have a few ideas about where some of your over-spending happens. Perhaps you tend to eat out more than you’d like to, or waste money in areas you’re not proud of. My encouragement to you is to ignore those thoughts for now! First, go through the exercise of putting together a simple, straightforward budget. You might be surprised at how much or how little you spend in certain areas. Who knows, maybe you’re walking around with a guilty conscience when your spending is totally fine! Budget first, analyze later. Also, be prepared to practice some patience with your spouse during the process. It’s difficult to look at spending reports with another person, when perhaps you don’t agree 100% with how you spend each other’s money. You won’t see eye-to-eye on every aspect of your budget, so give some grace. Maybe start out with some larger categories for “Slush fund” so that no-one feels judged during the process. Concentrate on the areas you agree with each other about first. Part of keeping a budget is tracking your expenses. 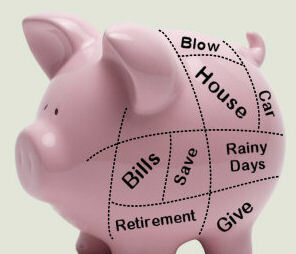 This is a fact of life, since no one knows exactly how you think about your money. But take heart! There are many tracking tools available that will make this process MUCH easier. And in the next post, I’ve got a tip for how to keep that tracking as simple as possible. A few minutes a week is all it takes to keep up with your spending. And I’m willing to bet that if you’re reading this post, then tracking your money (properly, of course) won’t be that much of a burden for you. In the next post in this series we’ll put pen to paper, and break down how to create your own budget from scratch. Stay tuned!